The story revolves around Rin Okumura, a teenager possessing abnormal strength and endurance who, along with his younger twin brother Yukio, was raised by Father Shiro Fujimoto. Soon after Yukio departs to study at the prestigious True Cross Academy, Rin learns that he is the son of Satan, the strongest of all demons. Witnessing Shiro dying to protect him, Rin ends up doing what his guardian asked him never to do: draw the demon-slaying blade Kurikara, which restrains his demonic powers, from its scabbard. From that moment on, Rin not only gains permanent demonic features like fangs, pointed ears, fiery "horns" and a tail, but also the power to ignite himself into blue flames that can destroy almost anything they touch. 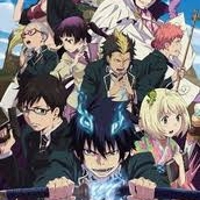 5408 users rated Blue Exorcist [TV].